It is suggested that the students be funded by their sponsoring clubs and by Rotary clubs helping to raise funds through various fundraising projects, pledges, and by your club support! Your Rotary club and the New Generations students can make a real difference in the lives of the people of Haiti. This is a wonderful opportunity for fellowship, and the impact will be immeasurable. Register to volunteer and/or donate to: Sam Martinez, Interact Advisor, by e-mail: smartinezsam@aol.com, (mail checks/donations to address shown below). When: Saturday, April 30, District Conference, Marriott’s Lincolnshire Resort, indoors at the Picnic Grove Pavilion. Pledge: $50 per packer per hour (for purchase of ingredients, which provides six meals). 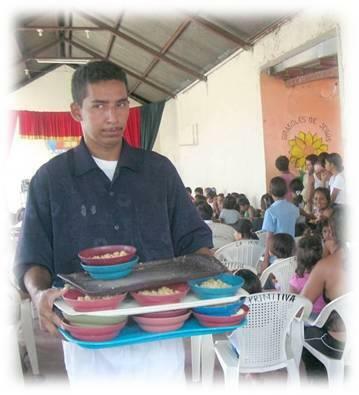 Lunch will be served to Interact and Youth Exchange volunteers.